The New York City Council just passed the bill to cap the number of Uber drivers for 12 months, along with four other bills. An overwhelming majority of the City Council’s 51 council members voted in favor of the bills. The City’s 12-month pause on new vehicle licenses will threaten one of the few reliable transportation options while doing nothing to fix the subways or ease congestion. We take the Speaker at his word that the pause is not intended to reduce service for New Yorkers and we trust that he will hold the TLC accountable, ensuring that no New Yorker is left stranded. In the meantime, Uber will do whatever it takes to keep up with growing demand and we will not stop working with city and state leaders, including Speaker Johnson, to pass real solutions like comprehensive congestion pricing. UBER-CONGESTED. The New York City Council is expected to vote on setting a cap on all new Uber vehicles on Wednesday. The bill, if it passes, would halt the issue of any new licenses for any new ride-hailing service drivers for a 12 month period. Several outlets have reported that the City Council is likely to vote in favor of the bill. If the vote goes as predicted, the outcome could be a boon to drivers and, as the New York Times notes, "a major blow" to the ride sharing service. This is the first of several bills on which the City Council will vote in rapid succession. Others will decide a similar fate for other ride-hail apps like Lyft and Juno; another would establish a minimum pay rate (effectively a minimum wage) that ride-hail companies must pay its drivers operating in NYC. DECONGESTING NYC. These bills are a response to New York City’s increasingly congested streets, for a number of people, including leaders at the city’s public transportation authority, the MTA, have largely blamed Uber and its ilk. According to Bloomberg, the use of app-based ride services has skyrocketed in the last couple of years -- its drivers now represent "more than half of all for-hire cars on the road" in New York. Meanwhile, the number of iconic yellow cabs is virtually unchanged in the same period of time, thanks to a strict (and costly) medallion system. By limiting the number of ride-hailing service drivers, the existing drivers would be able to complete more trips, and make more money in the process. Predictably, Uber is not happy about New York City Council’s plans. 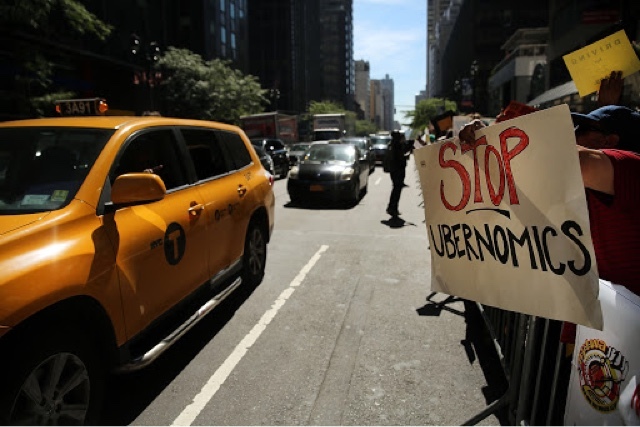 "A 12-month pause on new for-hire vehicle licenses will leave New Yorkers stranded while doing nothing to prevent congestion, fix the subways and help struggling taxi medallion owners," an Uber spokesperson told the New York Times. UBER-WORKED. In bringing this series of bills to the City Council, council-members hope to create a more sustainable job market for ride-hail app drivers. As the number of ride-hail drivers on the roads has risen, many have started to buckle under the economic difficulties of the situation. Most lack benefits like a 401K or health insurance. Low wages are rampant --a new report found that Uber and Lyft drivers in the U.S. only make a median profit (factoring in insurance, maintenance, repairs, and gas) of $8.55 per hour -- which is, in New York City, well below the minimum wage set by the state. The situation has become so grim for some that six taxi drivers have taken their own lives in New York City alone, according to the New York Times. Despite the tough situation for drivers, Uber has continued to grow. The company had a very healthy first quarter of this year, raking in a $2.46 billion profit, according to the Wall Street Journal. There are rumors that Uber might go public some time next year. A driver cap in the biggest city in the U.S. could put that plan in jeopardy. A 12-month ban on new licenses isn’t a death knell for the company, not by a long shot. But the cap might buy legislators some more time to study the effect the ride hailing industry has been having on the city, and make sure it’s working for everyone.